During the second half of the school year I've attended a number of meetings with both our Pre-School and Pre-Kindergarten teachers about how best technology can be used with Early Years children, and as well as that I've been reading a lot of articles that have reviewed the evidence on the use of ICT with young children. Currently there are a number of companies that make technology specifically for this age group, and some months ago we had a visit from a rep at TTS who left us a variety of different devices to try out with students. We have got Bee-Bots (programmable floor robots), digital cameras and video cameras, digital microscopes, voice recorders and iTouches and while these grades don't have IWBs they could access these in the computer lab if they decide to try them out. Recently I've also taken my iPad into classes and observed how the children use it. Developing dispositions to learning through their personal, social and emotional development. Extending knowledge and understanding of the world, including communication, language, literacy, problem solving, reasoning, numeracy, creative development and play. Most young children aged from birth to five years are growing up in media-rich digital environments in which they engage actively from a very early age. Family members ... actively promote the use of new technologies. They welcome ICT education ... and believe it should be included in the curriculum from the earliest days. Young children are confident with new technologies and are very willing to explore new gadgets that they have not encountered before. However a report by the University of Sheffield shows that often the official curriculum for the Early Years does not pay sufficient attention to the way in which children's engagement with literacy in the home is multimodal in nature. Over the past 10 years there have been rapid developments in the use of media and new technologies at home and many children are engaged with a range of digital media from birth. For example they watch television and DVDs, play computer games on the internet and play a range of console games, they play with interactive apps on mobile phones, use mobile phones and computers to speak and video Skype with relatives, take photos with digital cameras and use the camera features of mobile phones, view digital photos, read electronic books, listen to CDs and the radio. They already have an extensive knowledge of technology and media that they bring with them to school. It is important that mandated early years curricula begin to include these aspects of knowledge and understanding if they are to provide teachers with an appropriate framework for teaching in the 21st century. I was recently sent an interesting position statement about the use of technology from birth through to age 8 by one of our Assistant Principals. This statement from the National Association for the Education of Young Children states that "when used wisely technology and media can support learning and relationships." This statement, like those coming out of the universities in the UK, acknowledges that children live in a world of interactive media and that they are growing up at ease with digital devices and spending an increasing number of hours in front of and engaged with screens. There have been no large-scale studies of the use of ICT being linked to specific health indicators in young children, though there is some concern about the perceived amount of time spent on these activities and how this can contribute to early childhood obesity. When parents have been questioned about this, however, they have usually reported that their children lead well-balanced lives in which they use technology but that this does not displace other activities. What the report does state quite clearly, however, is that "each unique screen demands its own criteria for best usage". While the impact of background television and the passive use of screen media may be negative, some television shows and electronic resources have been carefully designed to incorporate what is known about effective reading instruction and are therefore powerful tools for teaching and learning. The report states clearly: "it is the educational content that matters - not the format in which it is presented" and that the "passive use of technology and any type of screen media is an inappropriate replacement for active play, engagement with other children and interactions with adults." Technology and media should not replace activities such as creative play, real-life exploration, physical activity, outdoor experiences, conversations and social interactions that are important for children's development. Technology and media should be used to support learning, not an isolated activity, and to expand young children's access to new content. 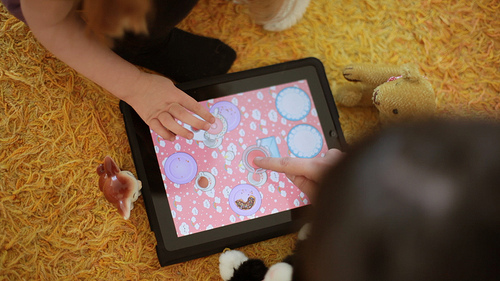 Mobile and multitouch screens have changed the way young children interact with images, sounds and ideas. Since children need time to expire the functionality of technology before they can be expected to use these tools to communicate, investigate the environment or locate information, it seems reasonable to provide access to technology tools for exploration and experimentation in school, in playful and creative ways. Many child-friendly apps allow students to make pictures, play games, record a story, take a photo or make a book. Technology can also offer opportunities to extend learning, for example exposing them to animals, objects, landscapes and so on that they do not experience in person. Technology can also help them to save and share their real-life experiences through their images, stories and sounds. Research has shown that there are many positive effects of technology on children's learning and development, both cognitive and social. Our Early Years teachers are also technology users - for example all have mobile phones and laptops and can use email and the internet. Some have said they are less confident in using spreadsheets, editing still and moving digital images and IWBs. However they are very interested in exploring the use of technology to strengthen home-school connections, for example sharing information and communicating with parents using email, blogs and FaceTime. Technology can also help teachers to record development of students, for example at my last school all the Early Years students had digital portfolios that were compiled by the teaching assistants in their classes - these included photos, audio and video recordings and samples of the children's work. Teachers who model the effective use of technology can also empower parents to extend classroom learning activities at home. It's important to realize that teachers will need support as they develop their own digital literacy skills in order to be able to identify and evaluate the technologies that will support existing classroom learning goals. Some of this, of course, can come from professional development, but much can come as a result of simply communicating with other educators. One of the 6 strands of ICT in the PYP is to become a responsible digital citizen. It is also important for the teachers of Early Years students to model acceptable, ethical and safe behaviours to help young children develop the skills they need to use technology responsibly.